As much as I’m told it doesn’t happen. I’m always worried my betta looks lonely. And if you’re reading this then you probably do too. Finding tank mates for your betta can often be difficult so you may be asking yourself “can betta fish live with snails?” If so, then keep reading to find out! 1 Can Betta Fish Live With Snails? 2 Do Bettas Eat Snails? 10 Will Snails Clean Your Fish Tank? 14 What’s The Ideal Tank Size For Snails? Can Betta Fish Live With Snails? In general, adding a snail or two to your tank will not cause your betta to become aggressive. Sometimes your betta may pick at it or nibble, this is because of curiosity more than aggression. However, this always depends on your betta. If you know that your betta is aggressive then you should avoid any other tank mates. But if you’re not sure then you should add one and see. Bettas will eat anything in your tank so if given the chance, they’ll try to eat your snails too. Because of this, it’s important to try and buy snails that aren’t small. Larger snails are a lot harder to eat. And while your betta may still try to get at the fleshy parts of your snail, a fully grown one is going to have a much better chance of defending themselves. You shouldn’t think that if you introduce a snail to your tank your betta will always eat it. Many betta owners have had a snail in their tank for many years without any issues. And there are ways to minimize the chance of your betta trying to eat your snails. The biggest one, of course, is making sure your betta gets a balanced diet. This includes giving them a combination of fish pellets and live food. Also, snails do have defense mechanisms put in place to stop them from being eaten. They have something similar to a trap door, which they can use to stop predators from eating them if they can shut it quick enough. So while it is possible for bettas to eat snails you can limit the chance of this happening. There isn’t just one type of snail to add to your tank. There’s a whole variety of different and exciting breeds. And it’s important to make sure you choose the right ones. Because some snails are harder to keep alive than others. And if you can’t keep your snail alive, then you risk contaminating your tank with a decaying body. Turret snails (also called Malaysian trumpet snails) are the first type of snail you can add to your aquarium. They grow up to 1.5 inches and live for a year. Also as you can see they require the same temperature and pH as bettas which means they are going to thrive in your bettas tank. They are great beginner snails because they don’t need much upkeep. As long as the water conditions are good they will thrive in your tank. A turret snails behavior is pretty much the same day by day. You’ll often see them foraging around on the gravel looking for any leftovers or debris. They commonly eat any food missed by your betta, dead plants, algae etc. One of the downsides of turret snails (and most snails) is that if left unchecked they can breed. Before you know it you may have a lot more snails in your tank than you want. Just like turret snails, ramshorn snails are similar in size and lifespan. As well as this they also require the same pH and temperature as betta fish do, so you don’t have to worry about changing your tank to meet any requirements. Ramshorn snails are best for tanks that don’t have a lot of plants in them. While they normally scavenge food off the floor, if they can they may start eating your plants. The good news is if your tank doesn’t have any live plants in it, ramshorn snails can still live off algae and old food. 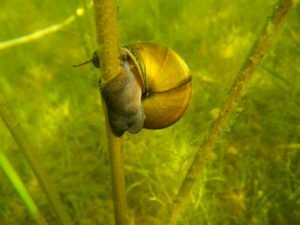 Once again ramshorn snails are the kind of snails you can put in your tank and forget about, as long as the conditions are good. With all snails, you need to be wary about how much their reproducing. If they have an abundance of food they reproduce at an incredible rate. Pond snails are some of the most common snails, and in fact, you may not even need to buy them. 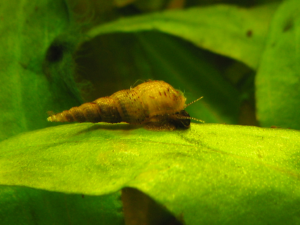 Oftentimes, pond snails can be smuggled into your tank on live plants without you realizing. They are great at removing algae from your tank as well as any old food and dead plants at the bottom of the tank. The only downside of pond snails is that they thrive best in a pH of 7.5. However, they can still live a happy life in a tank with a pH of 7 which is only slightly more acidic. Pond snails are the ones on this list that are going to reproduce the most. As long as there’s water in the tanks and enough food, it won’t be hard for their population to grow rapidly. Assassin snails are the snails you turn to when other snails are overrunning your tank. They reproduce slowly and they have one meal that they favor above the rest. As you can probably guess by their name, assassin snails eat other snails. However, don’t worry if you don’t have any snails in your tank. 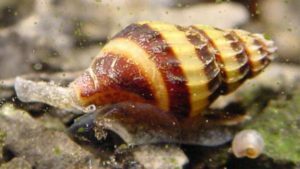 An assassin snail can still eat food left on the bottom of the tank as well as algae and dead plants. It is important to make sure that your assassin snail is getting meat though. So if there aren’t any snails in the tank try adding some freeze dried blood worms or other meat. Your betta will love it too! Assassin snails are the hardest to keep on this list but that doesn’t mean you should worry. As long as you keep your water parameters good you shouldn’t have a problem. I’d only add assassin snails to your tank if you really need them. Because of their size, your betta may see them as more of a threat and begin attacking them. But if other snails are overrunning your tank then they are your best option. 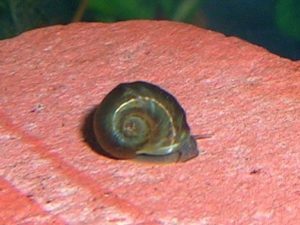 Mystery snails are another type of snail you can add to your tank. They’re easy to look after as well and don’t need any special care. If you want to introduce mystery snails with your betta just make sure they’re getting enough food. This normally isn’t a problem, if pellets or food are reaching the substrate your betta won’t eat it, but it will make a good meal for your mystery snails. Nerite snails are the smallest snails on this list but they shouldn’t be overlooked because of it. Because they are the best snails for removing algae. However, with nerite snails, you’re going to have to be a little bit more careful because they like a pH slightly more alkaline than bettas. But as long as you keep the temperature and pH steady you shouldn’t have a problem. If you don’t mind a snail that needs a little more care then nerite snails could be best for you! Remember: Make sure that you’re feeding all of your snails enough, especially food rich in calcium. Snails need calcium to help grow their shells, so you have to incorporate feeding calcium-rich food into their diet. Will Snails Clean Your Fish Tank? If you want to add snails into your fish tank then you may have heard that they’re good for cleaning your fish tank. And while this is true, it is a little bit misleading. It is true that they will eat any material on the bottom of the tank that you’d otherwise have to clean yourself. However, they still produce almost as much waste. If you plan on having snails in your tank you’ll still need to clean your tank. If you don’t the water conditions could deteriorate. Once they’ve deteriorated any snails you have in your tank could rapidly die. And there’s also the risk of your betta getting sick as well. 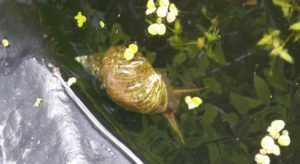 So YES snails will clean debris and algae out of your fish tank, but they’re also going to leave their own waste behind. Don’t be tricked into thinking that all snails like algae. Because the truth is some snails like it a lot more than others. 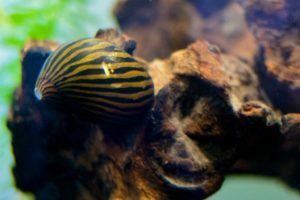 If you want to add snails to your tank purely for their ability to remove algae, then you should introduce nerite snails. They will eat a lot more algae than other snails as well as anything on the bottom of your tank too! However, that doesn’t mean the other snails won’t clean up algae too. Ramshorn snails and mystery snails also eat algae from time to time. And they can both survive without having live plants in the tank if they’re getting fed properly. If you’ve got a planted tank you may be worried about snails eating them. The good news is this doesn’t happen as often as you think. In fact, as long as your feeding your snails enough they should leave the plants alone. A lot of aquatic plants carry toxins in them which deter snails from eating them. Having anything dead in your tank is going to be bad for the health of your betta, as well as any other living creature. So it’s important to know when to spot and remove dead snails. The first thing you’ll notice is that your snail is lying completely motionless. Keep an eye on a snail and if you notice it’s in the same position for more than a day you’ll have to take it out. Use a net to scoop the snail out of the tank. If your snail is dead normally it will have a pungent smell when you remove it from the tank. Oftentimes, the inside of the shell will be completely empty as well. Because your betta has eaten it. Some people like to leave their snails in the tank when they’re dead. This way when their shells start to rot they add nutrients to the water. If you plan on doing this pay extra attention to the amount of nitrates and ammonia in the water. What’s The Ideal Tank Size For Snails? If you only plan on adding a couple of snails to your bettas tank then you’ll only need a 5 gallon tank. But just like fish, snails also produce their own bioload. If you want more snails you’re going to have to upgrade the size of your tank accordingly. And if you are housing more than 5-10 snails you have to make sure your tank can handle a sudden increase in snails, if they start reproducing. So a 5 gallon tank is fine, but when you want more snails you’ll need to go into the 10 gallon range. Even if your betta has a good temperament, they may try to eat your snails. Especially if your betta is hungry or the snails are small. There are so many different snails you can choose from, and they’re all going to have their benefits in your tank. If you want a snail that cleans algae you should buy nerite snails. If your snails are over-breeding then you should introduce assassin snails into your tank to eliminate them. Or stop feeding your betta as much. Even though you think snails can clean any waste food and decay, they’re also going to produce a lot of waste as well. If you see a dead snail in your tank you should remove it. Dead snails can begin to decay making the water dirtier as well as causing ammonia and nitrate spikes. If you plan on adding a couple of snails to your betta tank, then the minimum size you’re going to need is 5 gallons. However, with an increase in snails, you’ll need to increase your tank size. If you enjoyed this article remember to share it on social media and bookmark it as well! And leave any questions in the comment section. Guppies & Bettas – Guppies and bettas can live together in harmony when the conditions are right. While you’ll never be able to put a male betta with a male guppy, you can place females in the tank. Find out why and how! Can Tetras Live With Bettas? – If you want to know if tetras can live with bettas then read this article. You’ll find out about 5 tetras you can have in your betta tank, and some you should definitely avoid as well! African Dwarf Frogs As Tank Mates – It’s not just fish and snails you can have as tank mates, check out how African dwarf frogs can make fantastic tank mates for your betta! 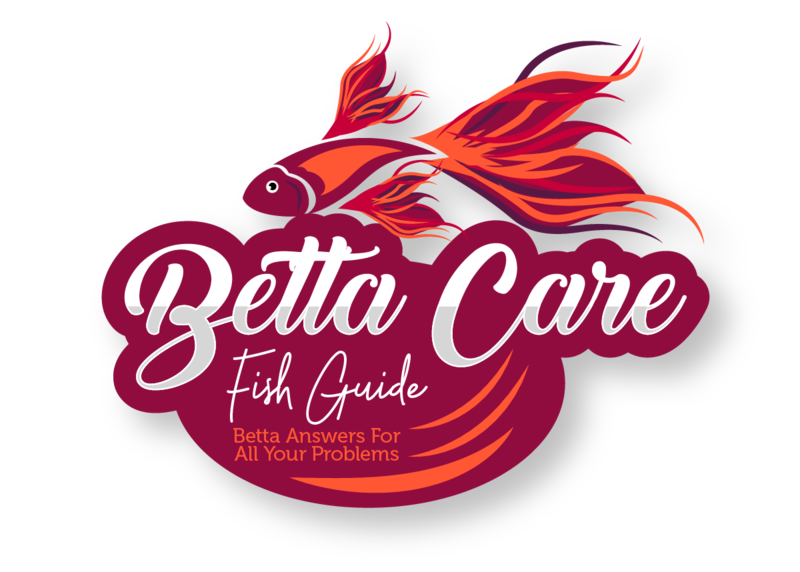 Platies And Bettas – A great choice to make for your betta tank mate! Find out what requirements these livebearing fish have!